It takes a lot more effort to cool down than it does to heat up. A person can layer themselves in large amounts of clothes or blankets, but cooling down may not happen, not matter how little clothing someone wears. 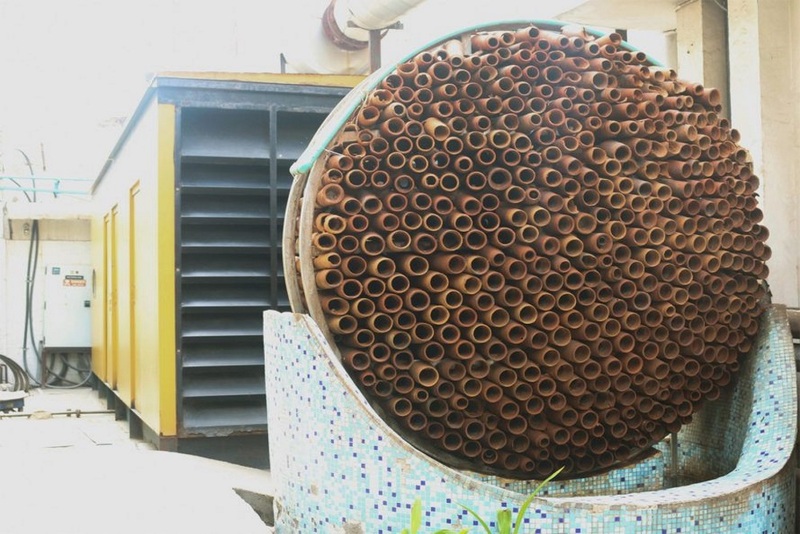 Relying on techniques perfected by the anciets, Monish Siripurapu, founder of architectural firm Ant Studio, developed an air conditioning unit made from clay that only uses wind and water to cool a room. This makeshift prototype was created to assist workers in India who were forced to continue working through the intense heat the country suffered in the summers. Not only was their morale affected, but their overall health was harmed due to extended exposure to these conditions. 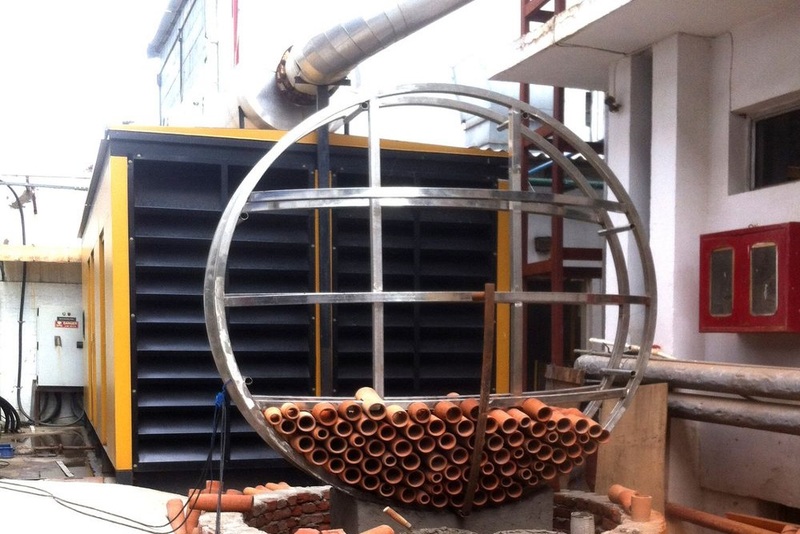 Ant Studio created the terracotta cooling unit for Deki Electronics and placed it in one of their factories. The device was able to cool a room that was originally 42 degrees Celsius down to 36 degrees Celsius. The Deki Electronics factory used its recycled water to go through the system. The installation was made from over 100 terracotta clay cones, each with a unique size and shape. 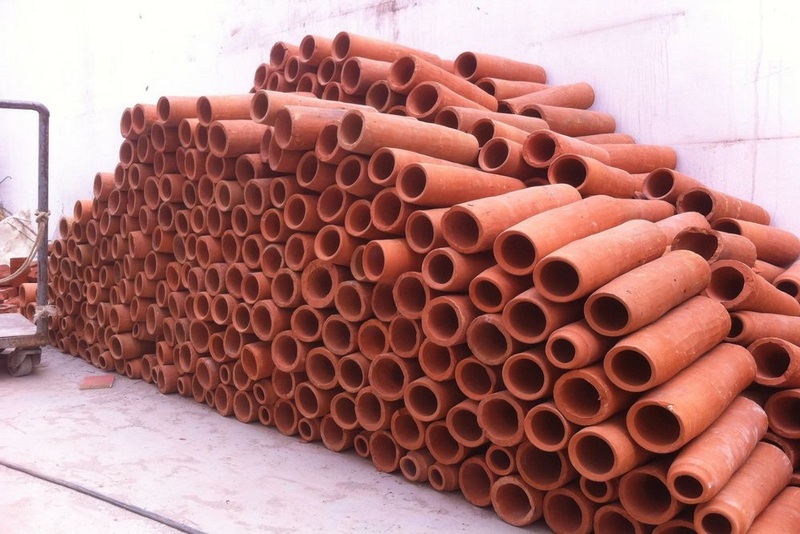 These large cylindrical cones get stacked on top of one another and lay over a small pond with a drip system running water through the cones. This set up then gets set up in a large, hot room. The room’s warm air goes through the cones, causing the water going through the system to slowly evaporate and cool the air in the room. This evaporation cooling method was used during the Egyptian period, a time when slaves were known to fan large clay pots filled with water to help it evaporate faster. Though Ant Studio’s large terracotta model wouldn’t fit in a small apartment or a room, it does offer a sustainable solution to keeping individual areas cool. To help fight global warming, more apartments could have built in clay structures with a water system that either comes from the building’s sinks or bathrooms to help keep residents cool. However, if a terracotta model does use recycled water it requires additional maintenance much like the water used in the Deki Electronics factory. Ant studio could see their design getting used to cool buildings or as an art display, with the running water providing a space with a soothing sound to center on.